The VMC® Spin Shot hook has been honored with the Best Terminal Tackle Award at the 2011 International Convention of Allied Sportfishing Trades (ICAST) in Las Vegas. VMC - the expert in hooks - has transformed drop-shot rigging with the introduction of the new VMC Spin Shot hook. "We are very excited to receive the Best Terminal Tackle Award," said Mark Fisher, Rapala director of field promotions and tournament veteran. "The VMC Spin Shot hook has changed the landscape of drop-shot rigging. Once anglers tie on a Spin Shot, we know they'll be amazed by its innovative design that will keep them in the game longer." The Spin Shot hook is the first of its kind to completely eliminate the worry of line twists when drop-shot rigging. To do this, VMC incorporated a light, but super-resistant, high-carbon steel black nickel spinning system into its premium VMC drop-shot hook. The hook features a nimble swiveling wire structure that guarantees 100 percent free rotation of the hook with any size lure attached. To rig, simply tie on the Spin Shot as a traditional-style drop-shot rig; the result is zero line twist with best-in-class lure presentation and action. Utilizing the Spin Shot not only prevents line twists and increases hook rates, but completely eliminates the need for an expensive hook, ball bearing and snap swivel combination - components that make finesse rigs bulky and limit rigging possibilities. The one-of-a-kind design of the Spin Shot hook features a Technical® bend, which increases resistance to the opening that transfers energy toward the point of the hook, holding the fish firmly in place when set. The Spin Shot hook is forged from Vanadium® steel that melds the perfect balance of lightness and resistance, with a sticky-sharp VMC Spark Point®. 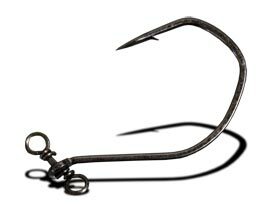 The Spin Shot is available in five drop-shot hook sizes including 1/0, 1, 2, 4, 6 and 8. VMC Spin Shot: drop-shot rigging's new best friend.